Its past five oclock on a Friday night and you are reading this article as a break from a mountain of work that needs to get done before Monday. You think, well, this is adulting, but at least there is good takeout! 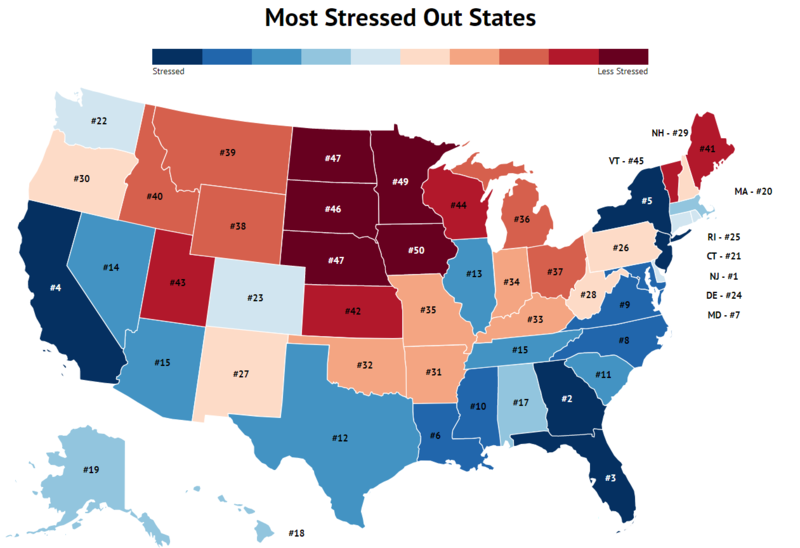 A lot of people are surprised at Georgia and Florida coming next to NJ in stress. People are saying that it is because of liberal transplants from CA, IL, NY, NJ, MD, DE moving to VA, TX, AZ, GA, FL, NC and changing the politics of the South. Look at how Gillum, Abrams are neck and neck in the South in polling. Look at how O’Rourke is running neck and neck in TX. What? You don’t want to enjoy the “slide show”? What is a “slide,” anyway? Yes, I spend a lot of time in both GA & FL and both states are becoming rotting liberal cesspools fast. It was bad enough with the hoodrats and meth-heads living among us, add to it MS-13, illegal aliens, and hundreds of thousands of soulless liberals and you’ve got a melting pot of insanity. He’ s never ran neck and neck! Latest polls have Cruz up by 10! Also most of the people moving are not lobs. I’ve knows lots of CA transplants, mostly milatary that got sick of the liberal crap. Beto is going to be crushed! The NC GOP could have dumped McCrory for a better electable Republican, Roy Cooper wouldn’t have won. Louisiana stressed out? These people must have spent their time talking to the lefty types in the French Quarter. Louisiana is indeed in some ways screwed up but stressed out no. Traffic is abominable on the major interstate in the mornings in NOLA, the blacks are truly dysfunctional and the culture is strange in place but stressful not really. Georgia - stressed out? The only time I am stressed out is when I see northern & westcoast libtards on TV! No, don’t think so. Beautiful, easy going, faith filled - it’s almost heaven. Great. I have lived in 3 states, all on here (NJ, VA, FL). Heck...if that's their criteria, Western Washington qualifies without a doubt! The Seattle-Tacoma area nails the bad end of those figures on pretty much everything. The rest of the state....not so much. Then again, if you look at the 2016 county-by-county election map, you'll see that the stressed-out areas voted Democrat, while the rest of the state voted Republican.